On an unseasonably warm night last October, I sat up with my ninety-four-year-old father-in-law at his Northern Michigan home. The window next to my chair was cracked open just enough where Dad wouldn’t question me about it. His health had slowly deteriorated over the past year and it was not easy to watch him struggle with everyday tasks. He was a fit, proud and ruggedly handsome man who still had a full head of thick, silver hair. He was seated sideways on the adjustable bed that was recently placed in the living room in front of the fireplace. I was exhausted from the thirteen-hour drive to come and see him, but it was clear he wasn’t about to sleep. He often got confused about what time of day it was. It actually no longer mattered to him which, when you think about it, is pretty great. I mean, who cares what time it is when you have so little time left? Dad and I talked often about his long and interesting life, especially his time training as a fighter pilot during World War II. On this particular night, I asked him one simple question: “What is your earliest memory?” He thought for a moment, smiled and began talking about the little girl he fought a boy over for the right to carry her books to school. He even remembered her name. I was astounded. Some quick math told me that his early conquest happened in 1929. Laughing, I said to him, “She must have been quite a cutey!” He nodded in agreement. In that moment, he was back there. Incredible. He couldn’t remember whether he ate breakfast, but he could clearly recall his pretty young crush. He could see the sun bounce off her shiny hair and he could feel his nervous stomach as he delivered her safely to her classroom. 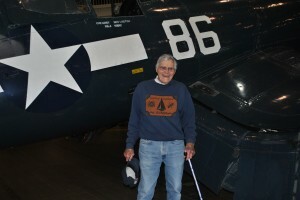 I will forever cherish my time walking around with Dad at the National Naval Aviation Museum in Pensacola, Florida. He was a rock star there. People would stop and stare as he slowly walked from plane to plane narrating his adventures. What an extraordinary treasure. When we came to a powerful fighter plane called the Corsair, he walked straight over to its signature “bent-wing” and he placed his hand on it. That familiar smile came over his whiskered face and he remembered, “One time, the metal on one of my wings began ripping apart in mid-air,” he laughed. 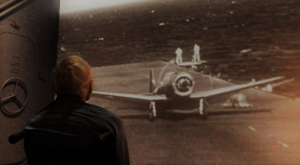 “I’ll never forget the sound of that metal tearing or the sight of those rivets flying in every direction.” As he spoke, my mind went black and white like an old movie. I pictured a fearless young man in his flight gear, seated in the cockpit, peering through the dirty glass at a wing slowly unraveling. “Holy crap! What did you do?” I asked. “Well, I signaled the pilot flying alongside me and I radioed that I’d be coming in hot,” he said, as if it was no big deal. Then he patted the wing with his hand like an old friend and moved on to the next plane. Dad passed away April 27. He was ninety-five-years old. I don’t have to wonder how he wants to be remembered; I asked him some time ago. Typical of Dad, he took about three weeks to answer. His engineer brain needed time to craft a perfectly meticulous response. One day, I received a letter. After talking and laughing about this for several days, your mom and I agreed that I would be most pleased if I was remembered as a loving, caring, considerate, faithful, and inquisitive husband, father, grandfather and friend. I enjoy teaching my children and grandchildren to seek solutions and I fiercely love this country. Once again, the greatest generation lives up to its lofty name. Clear a runway. A hero is home.